In every journey there is some sense of pilgrimage. The journey is both physical, with its hardships and trials, and metaphorical where we delve into a deeper self. To journey we have to leave the comforts of home and break from familiar routine, exposing ourselves to challenges and stimulation. In October 2015 I trekked to Kanchenjunga North Base Camp with my two sons Sam and William who are both in their mid thirties. Afterwards I read more about Tibetan philosophy, particularly the Tantric form of Buddhism initiated by Padmasambhava in the eighth century. Tantra is Sanskrit for thread or that which joins together. Practitioners aim to overcome the sense of separation that stems from a belief in the autonomous self. What fascinated me is the extent to which Tantric philosophy relates to the land. Padmasambhava described hidden idyllic lands which could only be reached through intense meditation and pilgrimage. These places, or beyul, are seen as both real and metaphorical, entered through increasingly secret layers, and have been sought by yogis and lamas ever since. I am not a Buddhist, but there is something in this which resonates with me, something about overcoming some of that separation between myself and the land. This is not just for inner reasons but also because I firmly believe that this present gulf in our society between people and land is the cause of so much of our increasing environmental catastrophe. We have lost the spiritual connection, the thread which binds us to our source and sustenance, and it is hurting. At the same time, I also wanted to slide a hand down that family thread towards my two sons to find a closer connection. After we land at Kathmandu International Airport, you will be greeted by our Nepali representatives who will also explain us about our trek. After the clarification, we are sent to our respective hotels to stay a night. Day 02 : Sightseeing tour in Kathmandu valley, overnight at hotel. After our breakfast, we will go for the sightseeing Tour to Swayambhunath Stupa, where you can see lots of monkeys and a beautiful view of Kathmandu Valley. This matured stupa is also known as Monkey Temple. After that, we will be visiting Bouddhanath Stupa, second biggest Stupa in the world and Pashupatinath Temple, famous Hindu Temple as well. Overnight at a hotel in Kathmandu. Day 03 : Fly to Biratnagar, overnight at hotel. Today from Kathmandu we will fly to Biratnagar. After arriving at Biratnagar we will prepare for our trek and make necessary arrangements. Overnight at hotel. 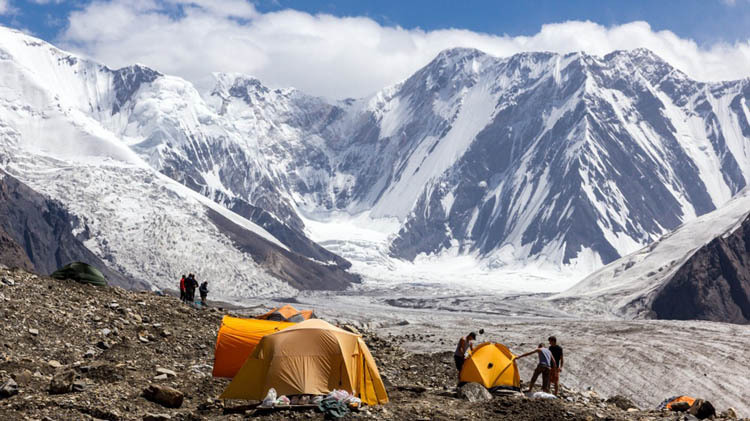 Day 04 : Fly to Suketar and start trek to Lali Kharka (2200meters), overnight at tented camp. We today fly from Biratnagar to Sukhetar taking 30-40 minute. After relaxing for some time we will move to Lali Kharka. After that we will be passing through pastures and pleasant settlements. After several drop taking around 3 hours, we will get there at Lali Kharka. Overnight at tented camp in Lali Kharka. Day 05 : Trek to Keswa (2100meters), overnight at tented camp. Today while walking across the steep way to Pokhara village, enthralling terraced farmland opens out before us as soon as we cross a suspension bridge over the Phawa River. Then our trail moves to Kunjari where we stop for our lunch. W will continue walking along the trail and see thick forests and also view a small village situated on a hill time and again. Trekking all along the gently sloping peak path, we will reach Tambawa and ultimately Bhanjyang. 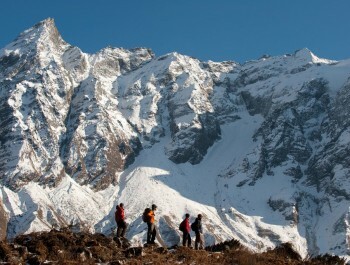 Here we will be enthralled by the captivating vistas of Kanchenjunga dazzling in the sunslight. After walking for around 5-6 hours, we will reach at Keswa where we will stay overnight. Day 06 : Trek to Mamankhe (2000meters), overnight at tented camp. Walking ahead from Keswa, we will move along the way to Nandeva River. After going across the river, we march along the glaciated peak passes. Further moving further, the path takes us through dense wood and pass through the village of Loppoding. 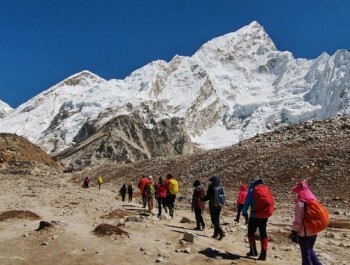 We will traverse shady regions where we can relax for a while from the exhausting trek. The twisting trail then moves further to the right shore of the Kabeli River. After a while, terraced pastures comes into our view again and the village of can also be seen. We will go on ascend till we arrive at Ponpe Dhara. When we go on along the track we can also see several settlements and terraced fields expanding along the top of the edge and apart from this Mt. Jannu arrests our attention. We will now descent along the twisting path, passing all the way through the village of Anpan and terraced pastures along the Khangwa River. We will cross a suspension bridge further move down on the rising and falling peak passes till we arrive at the village of Mamankhe where we stay overnight. Day 07 : Trek to Yamphudin (1650meters), overnight at tented camp. We have an easy day today. We will climb up to reach Yamphudin. The trail follows the hillside over the Kabeli River. We will go across the ridges and rivers that make way up to valley sides and the track eventually becomes level with the river. Along the way, we can stop to bathe in one of the many clear pools in this beautiful river. It is a truly tranquil spot and after that we will walk to Yamphudin. Overnight at Yamphudin. Day 08 : Trek to Lamite Jungle Camp (2920meters), overnight at tented camp. Our route today ascend a steep spur prior to dropping again and to go across the Omje River. Walking through an attractive, dense forest, we will reach at the peak this spur which lets us witness fine views of the valley to the south and of the Omje River Valley and to the North, Deorali Danda. A steep drop to the river unfolds to ourthe site to set up our camp in the Lamite forest to spend the night. Day 09 : Trek to Torontan (3080meters), overnight at tented camp. Leaving Lamite Camp we will ascend steeply for about 3 hours all the way through dense jungle to the peak of the Deorali Danda. From here, the dazzling Mt Jannu can be viewed. After going across the pass, we will move down across some moderately steep slopes before walking all along forested regions again. We again have steep descents which will take down into the valley of the Simbua River and after going across a suspension bridge, we will reach at Torontan. Overnight at tented camp in Torontan. Day 10 : Trek to Tseram (3750meters), overnight at tented camp. Following the right shore of the river, today we will pass through rhododendron and pine forests. The trail is rather vertical and moving ahead we can also have glimpses of the snow-topped giants to the front and the massive muzzle of the Yalung Glacier. Just before reaching Tseram, the towering altitudes of Rathong and Kabru will also come into our view. Overnight at tented camp in Tseram. Day 11 : Trek to Ramche (4360meters), overnight at tented camp. Today we have a short day walk to reach Ramche. 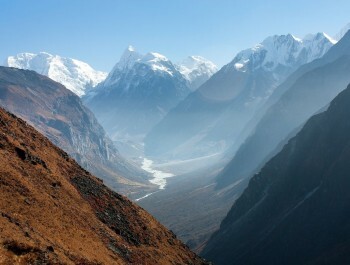 The vista from here is splendid as we go up to the Yalung Glacier. An ice-covered lake, very much clear streams and views of Kokthan, Kabru and Rathong are the main fascinations of todayâ€™s walk to Ramche. Overnight at tented camp. Day 12 : Exploration around Ramche, overnight at tented camp. Today we set off for witnessing the first close views of Kanchenjunga. Walking all along the track, we will come across the South face of the mountain. The ridge creates a circle which is over 15 km and not less than 7500m. 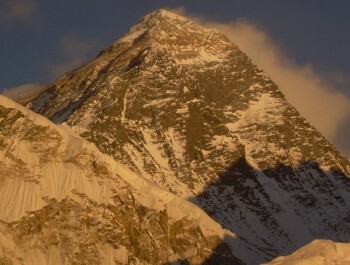 Along the ridge we will see three main peaks of Mt Kanchenjunga at 8586m, 8420m and 8474m. Proceeding ahead to Oktang (4630m), we move down to the glacier and traverse it to a peak below Talu from where we can witness the beautiful view of the mountains. We will then return back to our camp at Ramche to stay overnight. Day 13 : Trek to beyond the Mirgin La, overnight at tented camp. Today we will trek down the valley, passing all the way through the small settlement of Lapsang, before moving to the Mirgin La, it is the pass we go across in order to arrive at Gunsa. After that we go down from the Mirgin La, the scenes of Mt Jannu appears in front of us magnificently. Overnight at tented camp. 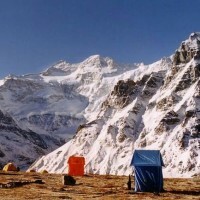 Day 14 : Trek to Ghunsa (3475meters), overnight at tented camp. Today we will descend on a superb trail to reach at the village of Gunsa. Gunsa is a Tibetan community with a tiny Gompa and prayer flags waving at the top of the wooden houses. You will also have an excellent chance to visit a strange local pub and taste a drink 'tongba', an alcoholic brew fermented out of millet. Day 15 : Trek to Khambachen (4040meters), overnight at tented camp. Our trail now makes way up to south part of the Ghunsa River. We then have a steep climb to a hill from where it goes across a slide and then makes way down to Lakepo. A short climb, we will reach at the village of Khambachen (4040 m). 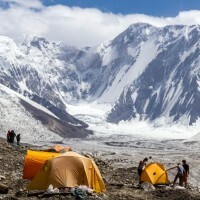 Day 16 : Trek to Lhonak (4790meters), overnight at tented camp. Ascending through rocky fields we will reach Ramtang (4790m) then cross northwest face of the Kanchenjunga Glacier and we will arrive at Lhonak. Lohnak is on a filthy plain near a dry lake. There are striking mountain sceneries all around. Overnight at Lhonak in tented camp. Day 17 :Trek to Pangpema (5140meters), overnight at tented camp. The core part of Kanchenjunga peak comes to our sight only from Pangpema. 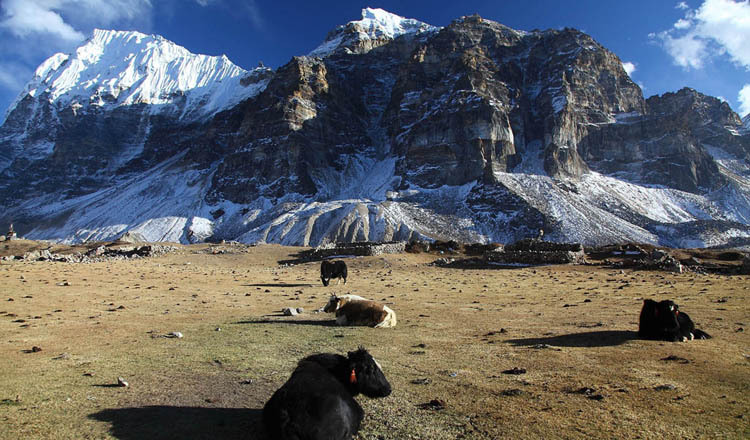 Pangpema is the base camp for trek to Kanchenjunga. From Lhonak, the trail steadily makes way up and goes across the plain land but after that gets steeper. Overnight at tented camp in Pangpema. Day 18 : Rest at Pangpema, overnight at tented camp. Today we have a rest day at Pangpema. 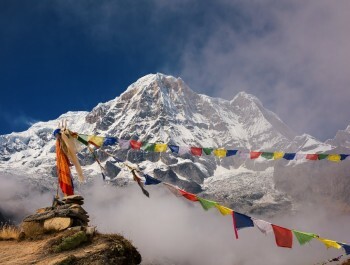 If you are interested to take up a morning hike up an edge, north of Pangpema you can begin in the morning. 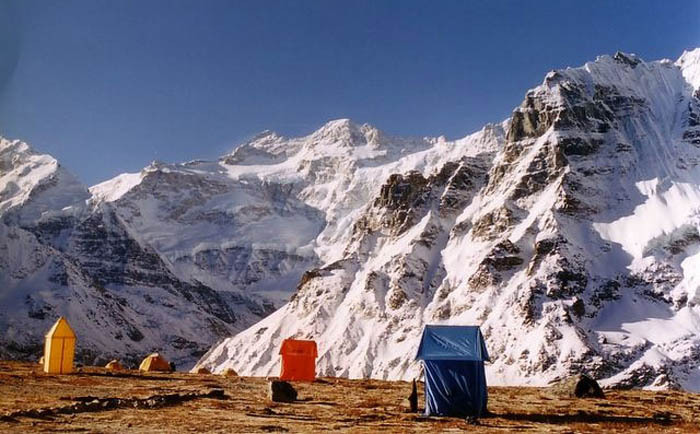 You will have a climb of around 300 meters up and offers a great vantage tip with views of Kanchenjunga, Tent Peak and Wedge Peak. Overnight at tented camp again. Day 19 & 20: Retreat trek to Ghunsa, overnight at tented camp. Day 21 : Trek to Kyapra (2300meters), overnight at tented camp. 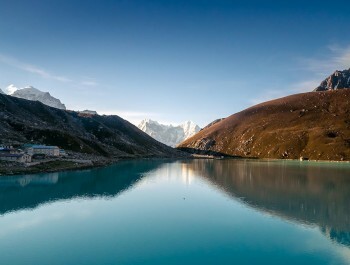 From Gunsa, our way passes all along the eye-catching Gunsa and Tamur Rivers and passes through stunning forests of rhododendron, birch, conifer and oak. Now the trail passes the river as it flows downwards. We now pass all along Kyapra which is the last Tibetan settlement. Overnight at tented camp. Day 22 : Trek to Sakathum (1600meters), overnight at tented camp. We today, move ahead from Kyapra to reach Sakathum. Our route moves all along the falling and rising trail for few hours until we arrive at Amjilasa. From here, it is a long vertical way down from where we can observe the Gunsa River Valley. Overnight at tented Camp in Sakathum. Day 23 : Trek to Chirwa (1180meters), overnight at tented camp. Today on the way we will see the union of two rivers- Gunsa Khola and Simbua Khola at Tamur Kosi. Walking furthermore along the Tamur River, we will cross many other small streams. After trekking for around 4-5 hours we will enter the pleasant village of Chirwa. Day 24 : Trek to Phurumba, overnight at tented camp. On this day we will walk through agricultural land and rich meadows. As soon as we arrive at Mitlung, we will stop for our lunch. After that we will walk on the crisscross way through the steep stony paths. After ascending for around 4 hours we will reach to the valley of Phurumba. Overnight at tented camp in Phurumba. Day 25 : Trek to Suketar (2300meters), overnight at tented camp. Today we will move up along the edge for around 3 hours and reach at the village of Taplejung. We will explore around Taplejung to explore the way of life, culture, tradition and more. Then, we will move on ascending for about 2 hour and finally reach the airport at Suketar. Day 26 : Fly to Kathmandu via Biratnagar, overnight at hotel. On this day we will fly back to Biratnagar and then take another flight to Kathmandu. You will be transferred to the hotel after you reach Kathmandu. Day 27 : Rest at Kathmandu, overnight at hotel. Today, our day is separated to do our own stuffs such as shopping in Kathmandu or if we want, we can even stay in our Hotels and rest for the whole day. Tonight, we will be spending our night at the same hotel. Day 28 : Transfer to airport, departure on your own destination. Today, after the breakfast, we are transferred to Kathmandu airport for our final departure.